Mark the date! 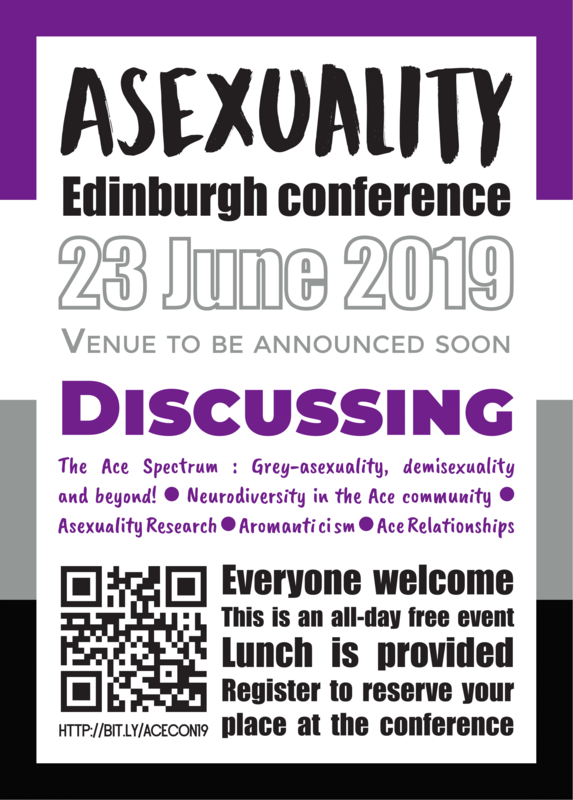 As many of you know we are planning to hold the UK Asexuality Conference 2019 in Edinburgh, on 23 June 2019, the day after Edinburgh Pride - which of course we're marching in! Many of you came to the UK Asexuality conference last year in London and there was much demand for a follow-up. Edinburgh is a new and exciting opportunity for us; I think it will be the first major ace conference held in Scotland! We are still confirming the venue, but we would like people to register their interest by filling out the following form. There will be a fuller registration form later, but this will give us an early indication of numbers. Plus, it will reserve you a place, in case we get fully booked up. There is no commitment at this point. Furthermore, one of the venues we are considering has an accommodation offer (at the conference venue itself, which is convenient): only £30 per night per participant. But for this to happen, we need to get 50 signed up to this. Thus it's still speculative at the moment. That's why it will really help us if you can fill out the form now. We plan to make the conference itself free as usual, but there will be an opportunity to donate if you can afford to help us cover costs. I hope to see many of you in Edinburgh this year! Still a cat ...with a 'stache. Wow, this sounds really interesting! Do you need volunteers for it? Is there a Facebook page to keep up to date? Hey, sorry for not responding sooner - your response seems to have slipped through my notifications. A Facebook page will be up soon Volunteers are always needed and we will be putting out a call for volunteers in the near future. Are you thinking of helping out? The FB page is already up! Please do help us share it.